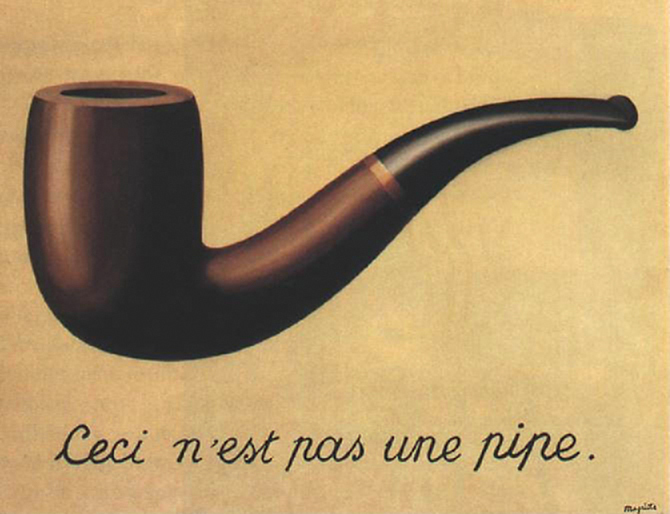 There is a long tradition of self-reference in the art world, Magritte’s pipe is classic example, but now it seems the self-referentiality that was a mark of the avant-garde is an established feature of popular culture. 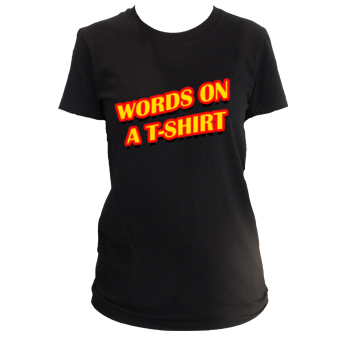 Call it vulgar self-referentiality if you like. Our sophistication, in fact, seems to be measured by the degree of our reflexivity and self-awareness — “I know, that I know, that I know, etc.” — which elides with a mood of ironic detachment. Earnestness in this environment becomes a vice. We are in a sense “mediating” or re-presenting our own selves through this layer of reflexivity, and we’re pretty sure everyone else is too. On the surface perhaps, there is a certain affinity with the Socratic injunction, “Know thyself.” But this is meta-Socrates, “Knowingly know thyself.” At issue for some is whether there is a subject there to know that would localize and contain the knowing, or whether in the absence of a subject all there is to know is a process of knowing, knowing itself. Leaning on Thomas de Zengotita’s Mediated: How the Media Shapes Your World and the Way You Live in It and Hannah Arendt’s The Human Condition , here’s a grossly oversimplified thumbnail genealogy of our heightened self-consciousness. On the heels of the Copernican revolution, we lost confidence in the ability of our senses to apprehend the world truthfully (my eyes tell me the world is stationary and the sun moves, turns out my eyes lied), but following Descartes we sought certainty in our inner subjective processes — “I think, therefore I am” and all that. Philosophically then our attention turned to our own thinking — from the object out there, to the subject in here. Sociologically, modernity has been marked by an erosion of cultural givens; very little attains a taken-for-granted status relative to the pre-modern and early modern world. In contrast to the medieval peasant, consider how much of your life is not pre-determined by cultural necessity. Modernity then is marked by the expansion of choice, and choice ultimately foregrounds the act of choosing which yields an attendant lack of certainty in the choice – I am always aware that I could have chosen otherwise. In other words, identity grounded in the objective (reified) structures of traditional society is superseded by an identity which is the aggregate of the choices we make — choice stands in for fate, nature, providence, and all the rest. Eventually an awareness of this process throws even the notion of the self into question; I could have chosen otherwise, thus I could be otherwise. The self, as the story goes, is decentered. And whether or not that is really the case, it certainly seems to be what we feel to be the case. So the self-referentialism that marked the avant-garde and the theories of social constructivism that were controversial a generation ago are by now old news. They are widely accepted by most people under 35 who didn’t pick it all up by visiting the art houses or reading Derrida and company, but by living with and through the material conditions of their society. Whatever the particulars, to the extent that you are mediated, your personality becomes an extensive and adaptable tool kit of postures . . . You become an elaborate apparatus of evolving shtick that you deploy improvisationally as circumstances warrant. Because it is all so habitual, and because you are so busy, you can almost forget the underlying reflexivity. There seems to be a tragically hip quality to this kind of hyper-reflexivity, but it is also like looking into a mirror image of a mirror — we get mired in an infinite regress of our own consciousness. We risk self-referential paralysis, individually and culturally, and we experience a perpetual crisis of identity. 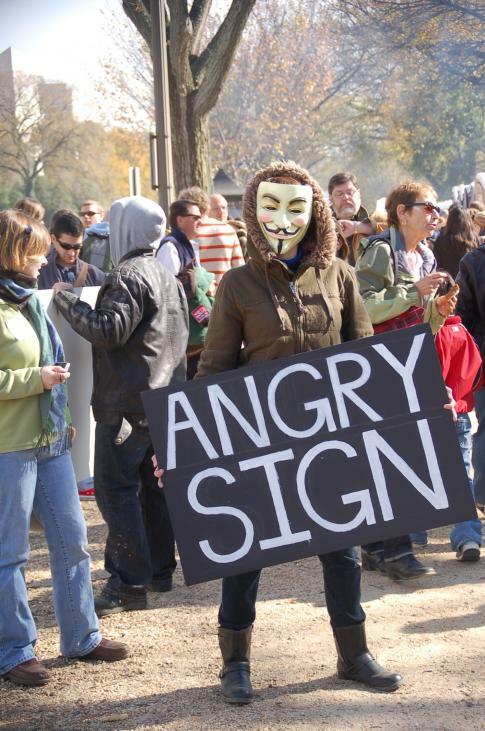 My sense is that a good deal of our cynicism and apathy is also tied into these dynamics. Not sure where we go from here, but this seems to be where we are. Or maybe this is all just me. I wonder about this sometimes too – have we become so meta, do we have so much ironic distance, that we have actually obliterated the self in our discourse? When I read Derrida, or Lacan, I wonder, if the self is formed only after we possess language, and in language, meaning is always slippery and unstable, then what is the point of continuing to communicate with others, or even ourselves (but then again, I interpret much philosophy as inherently but unconsciously nihilistic). This whole theory of performativity, whether it be gender or versions of a self, is good up until a point, and that point is, I think, communication with yourself. Do I perform roles when thinking? Is the self that thinks inside of my brain a fragmented individual (a better question, I suppose, might be: is it the self that thinks?)? Or are theories of performativity and the fragmented self just ways of justifying the fact that people are changeable creatures whose inner workings and thoughts are difficult to ascertain. I always enjoy reading your posts – thanks for another thought-provoking essay. Also, thanks for the link to that trailer. We’re discussing trailers in the film class I’m TAing for, and I think that this fake trailer could help show my students the constructedness of trailers. Really good questions. I wrestle with some of these same issues. Interestingly, Lacan and Derrida (or their followers) are divided on just this point. 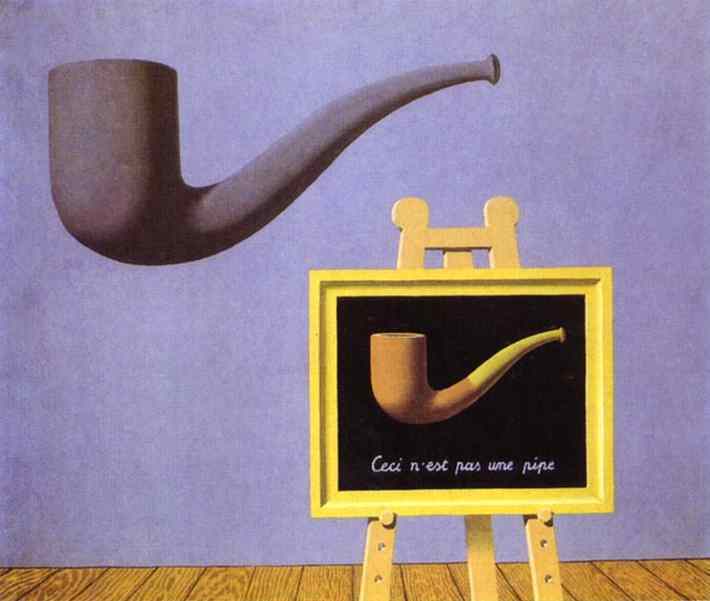 In Lacan’s framework there is a “Real” at the core of human identity; it is beyond language and anchors identity. Or, at least that is my understanding. I do appreciate Theory and I think it can be helpful, but my sense is that if it untethered from ontology then you just drift toward nihilism as you suggested. Maybe we might say that epistemology without ontology leads to nihilism. It seems to me that there should be a dialectic between the two. Regarding performativity and the self that thinks, I tend to think that we do internalize the roles we play to some degree. We’ve always been shaped by roles and institutions (Althusser is on to something)and I think that is still the case, it is just that we are much more aware of it. So one would think that this awareness would mitigate the subject formation and that we are in some sort of post-ideological moment, but then someone like Zizek comes around saying that this post-ideological stance is itself an ideology, etc. Down the rabbit hole again. Generally, I believe we are divided selves (Paul and St. Augustine already knew that), and it is as you say “difficult to ascertain” our inner workings. Theory provides a variety of perspectives from which to think about subject formation, some more helpful than others, and they are more or less helpful to the degree that they offer helpful/adequate explanations of a reality against which our Theory bumps into whenever it makes claims about the world. Does that make any sense, I’m just thinking as I type? Lacan’s “real” always seems problematic to me because his “real” seems far too much like Freud’s id (the “real” is a state of nature, where you aren’t separated from the external world and are driven by need – well, that’s my understanding, at least, and I’ve only read Lacan in translation). I don’t like to think of my self as pure mammalian instinct/need (of course, that doesn’t mean that couldn’t be true). I agree about epistemology without ontology. I think that sometimes theories put those two concepts into a binary rather than a dialectic, which would probably be more useful. I haven’t read a lot of Althusser (just really small excerpts in lit theory anthologies). I might have to check out more of his writing. What you said definitely makes sense to me (though, if we are going to be post-structural, I will never truly be able to know what you said, only what I think you said). Theory is useful to me insomuch as it provides different ways of thinking about a text or an issue, but I haven’t yet found a theory that doesn’t have holes and biases that make it less useful than I ultimately want it to be. I’m old-school, though. I want to be able to believe in whatever theory I use. Instead I end up taking the very unpopular route of eclecticism that some people call cultural studies, using theories only insofar as they contribute to my work (a bit of this theory, a bit of that theory – it ends up being a sort of Frankensteinian affair, but it works for me). Lacan’s real certainly parallels Freud’s id, with a semiotic spin, I don’t know that I would embrace it as is, but there’s at least this sense of a fixed point within the maelstrom of identity and personality. I’m intrigued by the notion of connecting the “real” with our embodiment, not in the sense of reducing us to biological drives (I’m likewise allergic to that sort of reductionism), but in terms of the knowledge that we carry about at a less than conscious level from the cultural rituals and practices we engage in … still thinking on that, just a hunch at the moment. I’m all for the “old school” sentiment and the Frankensteinian approach (or, baroque theory as some call it) … thanks again for the interaction, very helpful. Thanks, Mike, for this. But in your roundup of items such as this, I think you missed a crucial one: a music video and song combo where, instead of the video telling the story of the song, the song is reverse engineered to tell the story of the video. Truly inspiring. (Just kidding about that last part). Thanks for that. I had seen the “Take On Me” video subjected to the “literal” treatment some months ago and found it pretty funny. Not surprisingly it was just the first of many!